byte.to Effortless Living Wu Wei and the Spontaneous State of Natural Harmony - Filme, Spiele, Musik, Bücher und mehr kostenlos downloaden. The practice of non-doing, non-forcing is an essential aspect of Taoism known as wu-wei. Attributed to the great sage Lao-tzu, the philosophy of wu-wei teaches you how to develop a natural state of consciousness not bound by thought or preconceived limitations. Experienced by the greatest artists, athletes, musicians, and writers, this heightened state of consciousness, referred to as being in the zone, is where intelligent spontaneity and effortless action flourish via a practice rooted in permitting the natural harmony of the cosmos to prevail. Merging Taoist philosophy, Hindu principles, and Confucianism along with scientific findings, Jason Gregory outlines the practice of wu-wei as a vehicle to realize our innate freedom, revealing that when we release our ego and allow life to unfold as it will, we align ourselves more closely with our goals and cultivate skill and mastery along the way. Equating being in the zone with a stillness of the mind, Gregory shares meditation practices coupled with yoga exercises from Patanjali that allow you to approach life with a mastery of acceptance, releasing deluded beliefs of how to achieve success that make your mind sticky and poised for conflict. The author shows how practicing wu-wei paradoxically empowers you to accomplish all that you desire by having no intention to do so, as well as allowing you to become receptive to natures blueprint for expressing beauty. Revealing wisdom utilized by renowned sages, artists, and athletes who have adapted being in the zone as a way of life, the author shows that wu-wei can yield a renewed sense of trust in many aspects of your daily life, making each day more effortless. 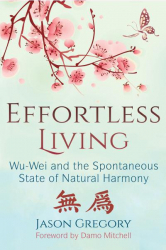 As an avid wu-wei practitioner, he provides keen insight on how you, too, can experience the beauty of achieving an enlightened, effortless mind while reveling in the process of lifes unfolding.